The model NS-908R of Marcy basically has similar look as another recumbent bike from Marcy as well, the ME-709. However, there exist a noticeable distinction in the prices of them: NS-908R is almost $50 more expensive than ME-709’s. In addition, the screen of NS-908R looks higher and more forward to user’s face. Nevertheless, is it the only thing worth $50 more? Marcy has years of reputation for its exercise equipments, in which the most noticeable one to be mentioned is the “recumbent” product line. Recumbent design consists of seat pad and backrest, enabling users to lean back while exercising. The seat is placed on the same level with two pedals, meaning trainers can work with horizontally stretched legs while pedaling a whole motion. This is a different product line over the upright model which has no backrest, instead user has to exercise at a forward biking position like a normal bike. The advantage of recumbent feature over the upright one is suitable for those who find upright bikes uncomfortable, or those who are recovering from a back injury and can not afford standard exercises without supporting tools. Indeed, the convenience of recumbent bike is to help users conform to the equipment and boost their workout to gain maximum effect while minimizing injuries. The bike is relatively easy to assemble with instructions all included in the manual. As the hardest and most complicated parts are pre-assembled by the manufacturer, it only takes me 1 and a half hour to do the rest. However, if you have another one to support, I recommend both of you to do the assembly since there are still some steps would be faster with two. Together with well-known recumbent feature, Marcy bike has built its reputation for sturdiness and heavy capacity design. Despite the fragile look, this 52.1-pound bike can carry user weight up to 300 pounds (lbs). With construction of premium steel frame and powder-coated finish, this combination allows a heavy capacity about 6 times more than its weight. In fact, I have been using this at high speed and hard resistance (level 7) and there is no weird sound or feeling of bust apart. It is suitable for above-teenagers and adults as a daily workout routine. People experiencing from obesity or overweight can absolutely happily use it as a part of fat burning process. Although 300 lbs is said to be the maximum capacity to fit, there exists a bit “weight cheating” around 10 to 15lbs of weight. It means that a 310 lbs-person can still ride the bike as usual, as long as they do not get on weight up to around 320 lbs after that, as it could not afford then. The bike is extremely sturdy. Regarding of its heavy capacity, it can work well with every day training at quite high intensity and last for years. In addition, it is sturdy enough to resist common scratches, chips and other damages from the environment. Marcy recumbent NS-908R has 8 different tension levels, which aims at multi-purpose using. It works for both gymers and fitness beginners. There is a tension adjustment knob under the seat. In order to adjust the preset level, rotate it counterclockwise or in opposite direction, depending on your workout goal. If you are on muscle-building process, try to increase and ride with as high level as possible. It is all about to tear out our muscles, allowing new ones to replace. Otherwise, your goal is to lose weight then long-hour biking sessions at average level (4) would be your suitable exercise for fat-burning success. Keep an eye on timer and calories burned, make sure that you can reach a specific calories goal every day. My friend used to have a knee replacement and doctor suggested the bike to him in the recovering period. As he can not deal with large and heavy equipments in the gym, this bike gave him enough tension to fasten the recovery while not harm his weak knee and back. The low levels of the bike is advisable for middle-aged people to stay healthy as well. My 78-year-old grandmother has her heart rate improved a lot with 40-minute riding daily. Nevertheless, since it is not intentionally built for hard workout, its 8-tension-level is quite light to a number of people who would be more satisfied if the company can add more resistance to the current bike model. The bike has a 3.5-inch LCD screen in front of the seat, on the eye level of user in sitting position. It is one-button-function and extremely easy for people to get used to with the interface as well as further instruction included in the manual. The computer has basically main workout metrics such as Speed, Distance, Time, Calories, Odometer and Pulse. You can choose among functions by press the button until the expected metric is showed, then you could jump right into the exercise. The computer is enabled to show single metric at specific time or automatically scan and show all the figures every 4 seconds. To turn the “Scan” on, press the button and select “Scan” mode. It is easy since this is one-button-function so I guess it won’t be a problem to anyone. The screen is set on the eye level of user, so it is convenient for them to observe the metrics while riding at the same time. I’m not fond of looking down to read the data as it will distract my riding and somehow, create wrong effect on the desired muscle groups. The variety of metrics are suitable for multi-purpose training, such as muscle tonning or fat-burning. For those who want to lose weight, set the time or calories burned to be displayed and focus on it while pedaling. Of course it is not always looking at the screen, I mean to keep an eye on it until you reach your daily goal. Especially for people with heart problem, the bike has pulse measurement along with other metrics. You could feel free to ride with this bike without worrying too much whether your heart rate exceeds safe limit or not. Again, keep an eye on it and monitor your pulse rate by slowing down your workout, it is under control now. The screen runs by 2 AAA-sized battery on the back. They are not included in the pack, so make sure you have them at home while assembling. The replacement is easy by remove the cover, inputting the 2 new and recover it. Notice that if you are about to replace the battery, your data will reset to zero. If they are important, make sure you have them noted down in advance. The most advantages of this bike I can say are the large seat and comfortable backrest. The seat are designed with two side handles and backrest. User can experience a hard biking below while leaning back comfortably. While upright bike form trainer into a forward biking position to gain effect on both legs and back, this recumbent model reduce most of stress on back instead. That’s why I always state that this bike works also for people with special conditions on their knee or back. The seat is oversized which is suitable for people with big hip as well. The seat can be adjusted forward or backward to fit different user’s leg lengths. There is an adjustment knob located between the main frame and the seat support. It has 6 position, with length ranges from 23” to 28” – from backrest board to both pedals. The adjustment is done easily by unlock the knob, slide the seat on the sliding frame to selected scale marked, then release the lock knob to fit the position. As mentioned above, the backrest is the main difference over the upright version. It enable user to rest their back while exercising, reduce most of the stress. Moreover, this backrest can accommodate 5ft to 6ft user’s height, so don’t worry if you have a long back. The bike is equipped with hand pulse sensor system, located on the two side handle bars. Basically, this sensor system will measure your heart rate through hands while riding and show the pulse figure on the screen. This function does not require any selection on the screen to activate; instead, when you start to bike and place both hands on the bars, the computer will automatically scan your heart rate. This is extremely necessary for people with heart problem. My brother has pre-existing exceeding heart rate and must go on a treatment to re-control the pulse. As training is a crucial part of the therapy process, he started with this bike under his physician’s consultancy. While pedaling, he keeps the low speed and keep watching on the pulse displayed. Whenever it is about to raise, he immediately slow down his biking to control the rate, together with steady breathing. Consequently, his result after 3 months was amazing, he somehow could monitor his heart rate from exceeding and indeed, increase the prevention from heart attack. Along with its main function of pulse rate measurement, I make use of them to gain balance while riding at high speed and tension. Although it works well with the backrest but I feel somehow more comfortable and safer with the handle bars to keep me from falling off the bike. This bike has pedals on the same level with the seat, enabling users to stretch out their legs horizontably while biking. This great since there are some biking equipments whose distance from seat pad to pedals is too short; although I can bike with it but there exist a feeling of stuck and uncertain effect on my legs. Biking with this is the same as normal biking but with much more comfortable as large seat and backrest are equipped. This bike allows pedaling both forward and backward, depending on your exercises. The pedals go with safety straps which hold your foot tight enough while biking. In fact, I never worry about the below pedals as they already fit and hard to slip off. The straps is adjustable to any foot size. As the seat is able to slip on the frame at 6 different position, it also a way to get your legs in a perfect biking position. The length from the backrest board to the pedal can be adjusted from 23” to 28”, quite a good range for the majority of US people. With the light and compact design, this Marcy bike is easy to move around your apartment. It only weight 61lbs and together with two wheels underneath, it is not so difficult to raise the handle and rear stabilizer up, rolling on wheels after your workout. Indeed, what really make the difference here is the two wheels, which reduce most of the bike’s weight while rolling on them. After finish exercising, you can move it to any small space for storage, such as room corner, under dining table or even little space between your coach and window. It is super space-saving. One thing to notice that it is easily moved on most surface: hardwood, tile, flat surfaces; there will be a slight dragging with carpet. For those who have a carpet in their house: make sure you have another space for this bike out of carpet, unless you would leave it there, otherwise you will get more difficulty moving it after exercising. As like other workout equipments, this bike needs a regular cleaning and maintenance. After daily exercise, I often clean it with soft cloth and a small amount of detergent, mainly the seat, backrest and handle bars. It is just as that simple. In addition, the pedal needs weekly re-tightening, although it does not mention this in the manual but I feel it a necessary maintenance tip to keep pedals at its perfect condition after highly intense workout. Before deciding to purchase this Marcy model, make sure you have an in-door space to store the bike. Keep it away from place with water such as the kitchen sink since excess moisture and water would cause rust on the frame. At least 24 inches away from the wall or/and any other object such as furniture because when you take it out for riding, the bike might hit and damage your furniture because of its great sturdiness. All the maintenance and storage instructions are included in the manual. The bike has 2-year warranty, for both manufacture defects and normal defects from shipping or delivery, etc. The majority of users love the comfortable backrest together with handle bars of the bike regarding its sensor and balance support function. They satisfy with the compact the design which fit in their small places together with price-efficiency. However, as many people want to build leg muscle, the 8-tension-level is quite light for them to break their workout limit. 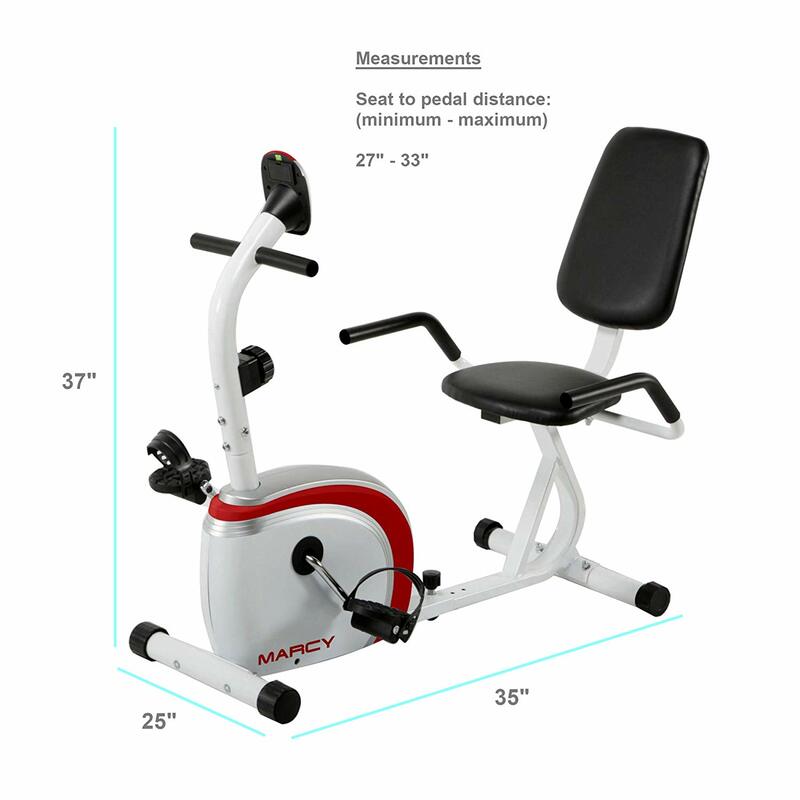 The price of Marcy NS-908R is a great price for a convenient and comfortable in-house workout equipment. Most of users positively feedback on its price-efficiency and has been happy with the bike so far. To sum up the review, Marcy NS-908R recumbent bike is a great workout equipment with advantage of compact design, heavy capacity. It has hand pulse sensor to measure the heart rate, big sized seat pad, comfortable backrest together with pedals can be adjusted to fit any leg length. It is easy to assemble and move around on wheels so it should be suitable for every family member. Nevertheless, the manufacturer should concern to diversify the resistance range, since it is quite light for muscle toning at the present. This is a good bike with budget under $200. Highly recommend!